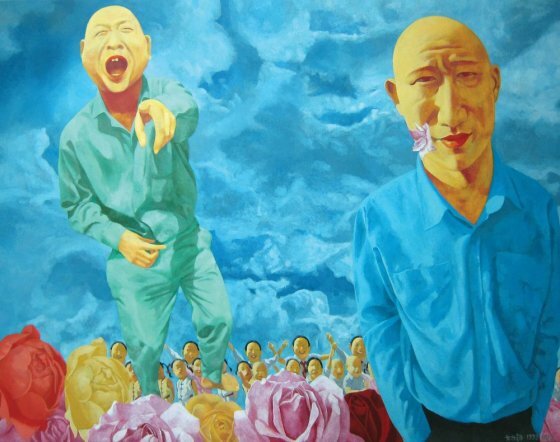 Fang Lijun’s works have been shaped by the disillusion he experienced as a youth: the Cultural Revolution, the Tiananman Square events in 1989 and the many social and political transformations China underwent in the past few decades. As art critic Karen Smith points out, “Fang Lijun points to both the innocence of childhood that had denied him, and the sense of loss this engendered as he matured, mingled with the mass blindness of society.” Through the howling, groping, laughing bald-headed protagonist, Fang Lijun’s works search for something meaningful in the world on a personal and political level, challenging the orthodoxy in China in times of great turbulence. His political statements are particularly vivid through the presentation of monkish bald mensome of whom walk in unison as if they were marching, some look pre-historic like cave men- all look programmed, controlled and lack a sense of direction. There is also an element of spirituality in Fang Lijun’s paintings that are often filled with people drifting up towards the clouds or submerging underwater, bald figures holding their heads up and almost in prayer.